Draft: 2015, Chicago Cubs, 1st rd. Ian, the Cubs first round selection in the 2015 draft, made his major league debut in 2017 ... has batted .242 (182-for-751) with 36 doubles, five triples, 39 homers and 112 RBI in 257 games with the Cubs ... Became the fastest player in Cubs history to reach 20 homers, doing so in just 89-career games ... Batted .275 (232-for-843) with 53 doubles, seven triples, 33 homers and 131 RBI in 227 minor league games ... Rated as the Cubs second-best prospect entering the 2017 season by Baseball America ... was third-best entering 2016 ... Ranked as the 28th-best prospect in baseball according to MLB.com's Top 100 entering the 2017 season ... Attended the University of Cincinnati where in 2015 he was named a First-Team All-American by ABCA and D1Baseball.com, a Golden Spikes Award semifinalist and the American Athletic Conference Player of the Year ... was a first-team Academic All-American as well ... Was a two-time Cape Cod League All-Star with Harwich (2013-14) ... Graduated from Mt. Lebanon High School in Pittsburgh, Pennsylvania ... batted .449 in four seasons with 33 doubles, 12 homers and 65 RBI. Ian played 142 games in his first full season for the Cubs, and was tied for second on the team with 70 walks, contributing to a .353 on-base percentage ... Recorded a .429 OBP as a pinch-hitter, the eighth-best mark in the N.L. ... went 7-for-23 (.304) with a team-high two pinch-homers and four walks ... Played every position except for catcher and shortstop, including at least 10 starts at all three outfield positions, as well as third base ... made his most starts in center field (49) ... Had a .816 OPS against right-handed pitching and a .608 OPS against left-handed hurlers ... His 15 home runs ranked tied for sixth-most among N.L. switch-hitters ... Batted .359 (14-for-39) with a 1.069 OPS off the bench ... Posted a .379 on-base percentage with a .256 average (60-for-234) and 11 homers prior to the All-Star Break ... however, produced a .313 on-base percentage and hit .196 (30-for-153) with four homers after the All-Star Break ... Belted the MLB season's very first pitch for a leadoff home run on Opening Day, March 29 at Miami ... became the first player to go deep on the MLB season's first pitch since Boston's Dwight Evans in 1986 ... Marked the first Opening Day leadoff homer by a Cub since Alfonso Soriano in 2009 ... Reached base safely in 16-straight games, May 6-26 ... posted a .462 OBP during the stretch ... Homered from both sides of the plate, May 7 vs. Miami, his fourth-career multi-homer effort ... Was the first Cub to homer from both sides of the plate in the same game since Dioner Navarro on May 29, 2013 vs. the White Sox ... Became the fifth Cub to accomplish the feat and, at age 23, surpassed Augie Galan at age 25 in 1937 as the youngest to do so ... Homered in both games of a doubleheader, May 19 at Cincinnati, becoming the first Cub to do so since Chris Coghlan, July 8, 2014 at Cincinnati ... was a single shy of the cycle in game one ... Went 5-for-11 with two doubles, one triple, two homers, five runs scored and nine walks in the club's four-game set at Cincinnati, May 18-20 ... his nine walks contributed to a .700 OBP in the series ... Scored a career-high three runs, July 14 at San Diego ... Made his first career pitching appearance, July 20 vs. St. Louis ... allowed just one hit in a scoreless ninth inning in the Cubs 18-5 setback ... Hit a game-winning three-run homer in the seventh inning, September 14 vs. Cincinnati ... erased a 2-0 deficit and lifted the Cubs to a 3-2 win. Ian made his major league debut in May and went on to hit 24 homers, the third-most by a rookie in Cubs franchise history and second-most ever by a switch-hitting rookie in the N.L. ... was the second-most by a Cubs player in his first major league season... Became the fastest player in franchise history to hit 20 homers, doing so in 89 games ... surpassed Kyle Schwarber's 97 games to reach 20 homers... Hit 13 homers prior to the All-Star Break, the second-most in club history by a rookie (Geovany Soto, 16 in 2008)... Despite spending the first month of the season at Triple-A, set franchise rookie records for a switch-hitter in homers (24), extra-base hits (44), slugging percentage (.514) and OPS (.842)... Ranked among the top five National League rookies in runs (62, 3rd), RBI (68, 3rd), stolen bases, (8, t-3rd), homers (24, 5th) and walks (39, 4th)... Tied for third on the team with 30 two-out RBI ... his 30 two-out RBI were tied for the second-most among N.L. rookies ... his 14 go-ahead RBI were tied for fourth on the Cubs... Started games at five positions: center field (41), second base (28), left field (11), right field (8), and third base (1) ... was the first Cubs player (and rookie) to start at five different spots on the diamond since Kris Bryant did so in 2015 ... he is just the 10th Cubs player to start at five defensive positions in a single season since at least 1910 ... thanks Ed Hartig... Batted .276 (29-for-105) with five homers as a right-handed batter and .243 (63-for-259) with 19 homers as a left-handed batter... Made his major league debut, May 13 at St. Louis, and hit a homer in the seventh inning for his first major league hit ... became the first Cubs player to homer in his first major league game since Jorge Soler, August 27, 2014 and the first to homer as their first hit since Willson Contreras, June 19, 2016... Homered in his first-career game at Wrigley Field, May 16 vs. Cincinnati ... became the first Cub to homer in his first MLB home game and first MLB road game since Carmelo Martinez in 1983 ... credit to NBC Sports Chicago's Chris Kamka... Hit his first-career grand slam, June 13 at the Mets ... at 22 years, 305 days old, he became the youngest switch-hitter in franchise history with a grand slam, besting Larry Corcoran's inside-the-park grand slam, June 20, 1882 at 22 years, 314 days old... Led the Cubs with eight homers in June, the second-most homers by a Cubs rookie in June in franchise history (Mandy Brooks, nine, June of 1925)... Notched three multi-homer games: June 4 vs. St. Louis, July 2 at Cincinnati and August 17 vs. Cincinnati ... joined Kyle Schwarber as the only Cubs players with three multi-homer games within their first 78-career games played... Hit his first-career pinch-hit homer, August 13 at Arizona... Clubbed a two-out, three-run go-ahead homer in the eighth inning in the Cubs' 5-4 victory over Cincinnati, September 29... Had four games with four RBI, one of just three Cubs players to accomplish the feat (also Anthony Rizzo, 6, and Kyle Schwarber, 4)... Batted .367 (22-for-60) with four homers and 13 RBI in a 15-game span, June 20-July 5 ... had two seven-game hitting streaks within that span, which marked his season-long hitting streaks... Was promoted from Iowa after batting .298 (31-for-104) with six doubles, nine homers, 25 RBI, 21 runs scored and a .977 OPS in 26 games... Went 1-for-7 with a walk in five postseason games with the Cubs. After being drafted in the first round of the June draft, Ian batted .259 (65- for-251) in his first pro action ... began his career with Single-A Eugene, appearing in 29 games before being promoted to Single-A South Bend where he finished the campaign... Batted .283 (30-for-106) with eight doubles and four homers in 29 games with the Emeralds ... after being promoted to South Bend, he batted .241 (35-for-145) in 38 games in the Midwest League... Hit his first professional home run, June 20, with Eugene at Everett ... also homered the next day... With South Bend, he batted .257 (29-for-113) against righties and .188 (6-for-32) against lefties. 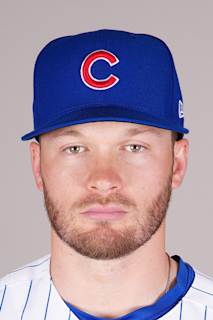 March 24, 2019 Chicago Cubs optioned CF Ian Happ to Iowa Cubs. May 13, 2017 Chicago Cubs selected the contract of CF Ian Happ from Iowa Cubs. May 7, 2017 Iowa Cubs activated 2B Ian Happ from the 7-day disabled list. May 2, 2017 Iowa Cubs placed 2B Ian Happ on the 7-day disabled list retroactive to April 29, 2017. Bruised left thumb. April 4, 2017 2B Ian Happ assigned to Iowa Cubs from Tennessee Smokies. January 27, 2017 Chicago Cubs invited non-roster 2B Ian Happ to spring training. June 23, 2016 2B Ian Happ assigned to Tennessee Smokies from Myrtle Beach Pelicans. April 6, 2016 2B Ian Happ assigned to Myrtle Beach Pelicans from South Bend Cubs. March 9, 2016 CF Ian Happ assigned to Chicago Cubs. July 25, 2015 CF Ian Happ assigned to South Bend Cubs from Eugene Emeralds. June 19, 2015 CF Ian Happ assigned to Eugene Emeralds. June 18, 2015 Chicago Cubs signed CF Ian Happ. June 18, 2015 Chicago Cubs signed LF Ian Happ. June 18, 2015 LF Ian Happ roster status changed by Chicago Cubs.